Dropped my ATV off on a Saturday and had it back on Monday. They took extra care to make sure the job was done right and even added some extras at no cost! Finally a place I can trust for keeping my ATV's running! Thanks again! They were the best thing to ever happen to my ATV! I had a sputtering that no matter what kind of additive I added to the fuel, it wouldn't go away. They fixed that and made what I felt were excellent recommendations. Great rates, great service! They do it all and I'm so impressed I'll be back next time without a doubt. Brian is the only one that i will let touch my raptor I know it is in good hands at Cypress ATV. After finding these guys I won't go anywhere else even though it's a small drive outside of the Houston city limits in Cypress, it's totally worth it. Highly recommended no matter where you live. 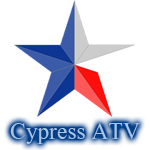 If you're a satisfied cusomter and would like to help me promote my service, then please send me a testimonial of your experience to brian@cypressatv.com and we will place your testimonial here.